Other: flavonoids like luteolin, triterpenes like ursolic acid. The herb is known to treat flatulence, relieve spasms, treat depression, fevers, induce menstruation, reduce blood pressure, stimulate the system, and is valued for its aromatic properties. Lavender is popular in a wide range of life spheres, including medicine, cosmetics, and cooking. It is found beneficial for headaches, particularly those associated with stress. 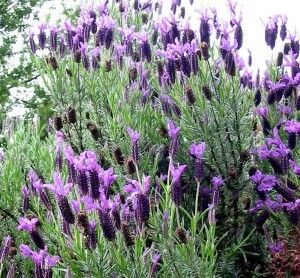 Lavender is an excellent remedy for depressive state, particularly if applied in combination with corresponding herbs. Being potent of mildly stimulating the nervous system it is used in cases of nervous exhaustion and debility. The herb provides good sleep and fights insomnia. As a topical remedy it may be applied as a stimulative remedy to relieve rheumatic pains. Commonly mixed with: To relieve depression the herb is mixed with Skullcap, Kola, and Rosemary. Additional Info: Lavender is indigenous to the Mediterranean countries. Preparation and Intake: To prepare an infusion, take a teaspoon of dry herb extract for 250 ml of boiling water, and steep for ten minutes. The result is taken thrice per day. As a topical remedy, the oil is used as an inhalant, a skin ointment, or a bath additive, but should not be taken orally. Safety: There is no data concerning the plant’s safety level. It is possible that the herb interacts with the medicine you use. Speak to your health-care provider before taking the medicine.